1. Clad in black timber, this backyard guest house is just the right size for a visiting friend or family member, and features a number of windows that help keep the tiny home naturally bright and ventilated, as well as some closet space for people who are staying a little bit longer. 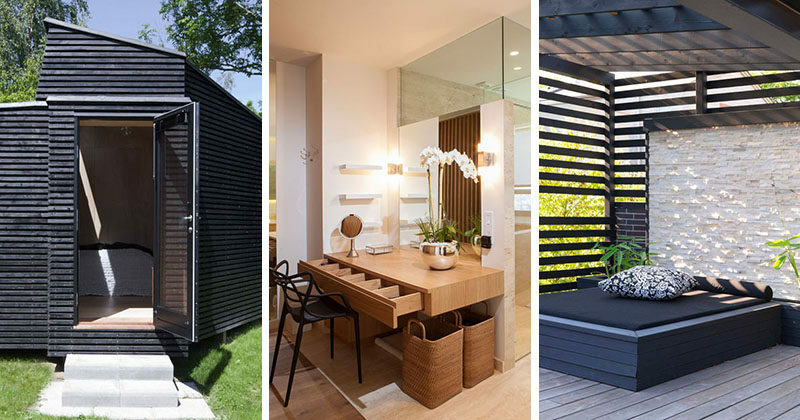 See more photos of backyard offices and guest houses, here. Designed by Martin Kallesø. 2. This gym has an landscaped outdoor area with hidden lighting under the steps, built-in planters, and a decorative screen that has an artistic leaf pattern that lights up. See more photos of this project, here. Designed by HOROMYSTUDIO. Photography by Timur Turgunov and Sergey Moiseev. 3. 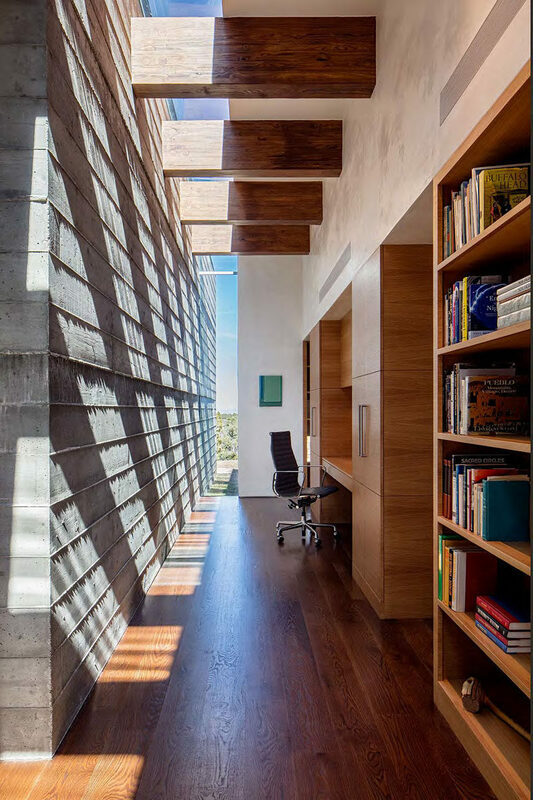 There’s a small home office in this hallway, with a built-in wood bookshelf and a desk. See more photos of this house, here. Designed by Specht Architects. Photography by Taggart Sorensen. 4. 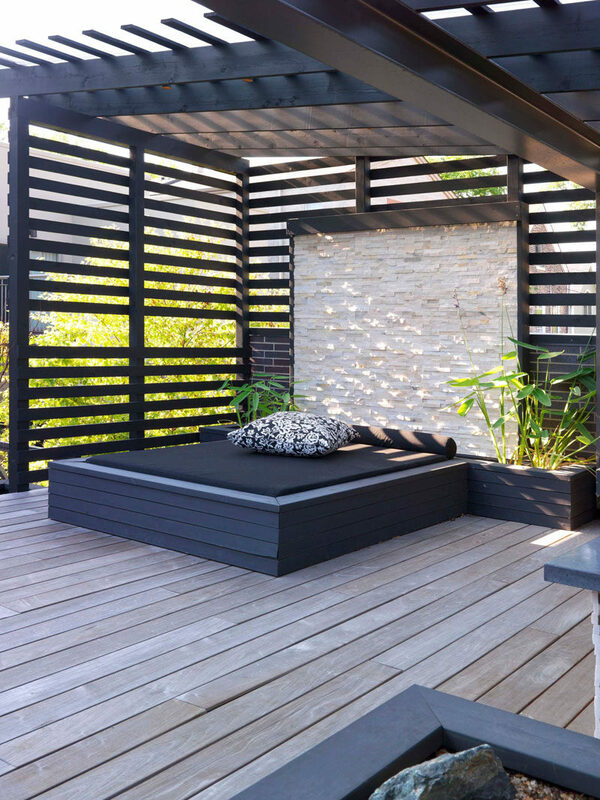 This built-in outdoor day bed with a stone wall and planters sits underneath a pergola that provides shade. See more photos of outdoor day beds, here. Designed by PROjECT interiors + Aimee Wertepny. 5. In this master bathroom, a custom floating vanity is the ideal spot for doing hair and makeup. Right next to the makeup vanity is the shower, with a stone and glass shower surround reaching all the way to the ceiling. On the opposite wall, there’s a floating dual-sink vanity and a soaking tub that you have to step up in to. See more photos of this apartment, here. Designed by Taller David Dana (TDDA).